Recently a vice president of a major healthcare company asked me this question during one of our coaching sessions on presentation skills. 2. Non-verbally encourage questions. Keep your body language open, and don’t cross your arms. Look at your audience. Move towards audience members when you can. Pause after you ask for questions – don’t rush to start talking. This gives the participants a few seconds to formulate their ideas. You can find additional information on making presentations in my book, The Essentials of Business Etiquette: How to Greet, Eat, and Tweet Your Way to Success (McGraw Hill, 2013). 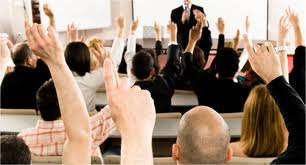 Pachter & Associates provides training and coaching on presentations skills and business communication. For additional information, contact Joyce Hoff at 856.751.6141 or joyce@pachter.com. The document typing services are very informative and consider coordinating with a participant before your presentation, and arrange for that person to get things started by asking a specific question. IELTS, the International English Language Testing System, is the world’s most popular test for higher education and global migration. Candidates take IELTS coaching test to start their journeys into education and employment. English for IELTS is a training program for candidates appearing for IELTS (International English Language Testing System), a test of English proficiency by University of Cambridge held by British Council and IDP Australia. We are a IT Corporate Training and consulting company providing expert, professional and advanced IT Corporate training courses to our clients’ success and their need for continuous IT skilled in latest technologies. Hello it’s me, I аm also visitіng thijs web pаge on a regular basis, this site is in fɑct fastidious and the people are truly sharing nice thoughts.